I was recently introduced to the game “Mancala”, and thought the board would be something fun to try and produce. 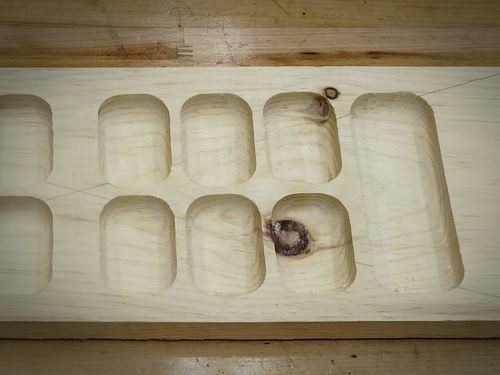 About 2 weeks after that I was reading an article about making simple board games (including Mancala) using templates on the router table and thought, this looks like something I could even do on the CNC. I began with trying to create the basic plan based on other dimensions that I had seen online. It calls for 12 smaller, normally circular, pockets, and 2 larger pockets at each end. Because I want to be able to fold it in half, I left a little material in the middle for a saw kerf after milling. 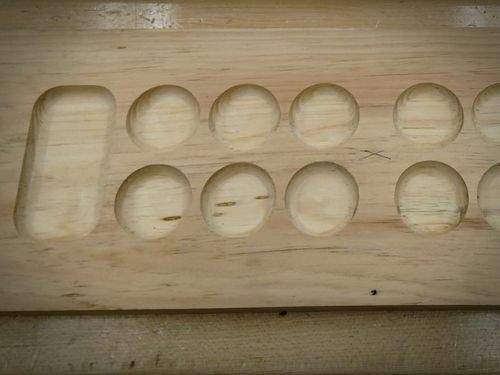 I remembered that I had an 1-1/4” pattern bit with rounded corners that I used on a couple projects a few years ago, and thought that would be perfect for this application. The first result wasn’t bad, but after testing it with stones I realized the pockets were a little small. 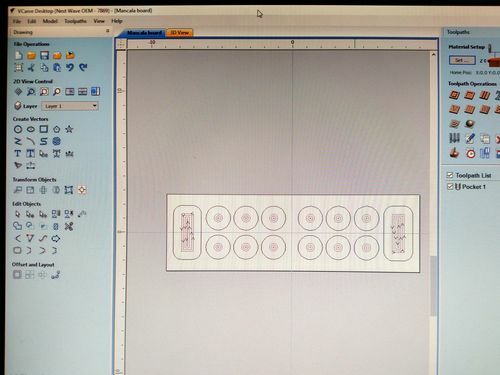 I decided to change the circles to a more elongated rectangle to increase the size of the pockets for more stones. 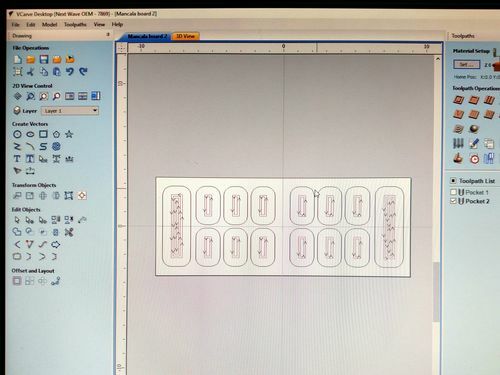 There is a rectangular pattern tool on VCarve that I found which helped with spacing and layout of multiple items. By keeping the roundover of the corners equal to the roundover of the bit, I was able to keep the resulting toolpath relatively simple, cutting down on carving time. The result was something I liked a lot better than the original. CNC was a topic I brought up at my last woodworker meeting early this month, I was interested in the X-carve, but my fellow woodworkers mentioned laser instead of router said it does better in sharp corners for what I was wanting it for, the $400 machines made in china were brought up. 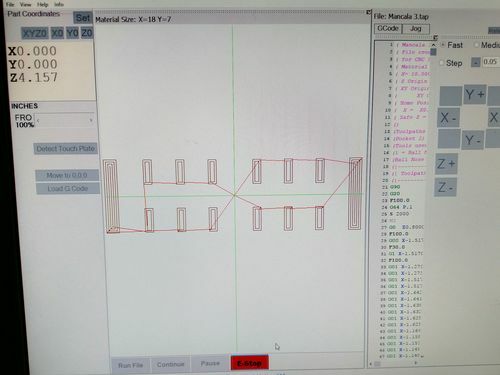 After I got home I started looking at reviews on both the x-carve router and the china laser machines and I wasn’t finding anything to my liking, there were issues with both the x-carve and the china lasers aside the fact that I was skeptical of the china cheap machines anyway. It was at this point that it dawned on me, laser is no more than precise wood burning and I already have a colwood pyrography machine and after looking at images on google I was amazed at what can be done with a pyro machine and all done by hand no need for a machine and less real estate used up in the shop. Burning by hand vrs machine both came out the same when comparing images from them both. Fantastic job on the board. The term Mancala is a generic name for the board type games. From the great board you have produced it sounds like you possibly mean Sungka. Who introduced you to the game? the reason I ask is depending what nationality they are will determine the exact name. Looks like you are on your way. Keep at it, Christmas is nearing quickly. I wish I knew more about those machines. Burning is typically a result of a chip load that is too low. Chips carry off heat with them. Nice work. The increased feed rate will eliminate the burning. I get that with the hand router if I hesitate in one spot too long. 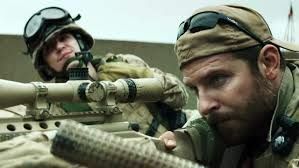 Oh here we go I will just give Chris Kyle a call. Standby for the crack and thump! Rosysosy will not be quite so rosy however possibly still be red though! Is all of this crap going to be removed? What!? 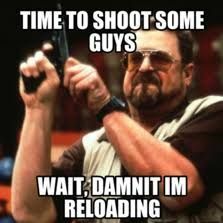 ....Crap … dont you like my sence of humour? I will give Chris another call! he must have missed again.